I now also have books on the 2 sister battalions so if you need anything on them please ask away. PS ,im always on the comp most evenings for any replys. Hi your listing doews not agree with the National archives. Interests:Currently researching my Grand Fathers service history in the Royal Artillery from 1905-1918. What about the 4th (Monmouthshire) Brigade. I am looking at Bombadier (Corporal) Alfred WARNES born 1894, (Army service number1552 later changed to 742059 Territorial Army number) who served in the Royal Artillery (Territorial) between 1914 and 1918 with the 4th (Monmouthshire) Brigade. The 1/4 (Welsh) Brigade RFA was part of the 53rd (Welsh) Division and served in Egypt and Palastine. I think the 1/4 was based around Risca/Newport. Hello Mike and welcome to the Forum. I do have your grandfather listed and concur with Gareth that his service number is 1503 and here is brief description of what I do know. I will PM you with a more comprehensive answer later in the week. He was a member of the original 1000+ men who were mobilized on 4 Aug 1914. They went initially to Pembroke Dock and from there to Oswestry then on to Northampton where they worked on digging trenches as part of the East Coast Defensive system. They left for France on the 13th Feb 1915 on the SS Cheyabasa arriving Le Havre 15th Feb 1915. During April and May he would have seen and been involved in some in very heavy fighting during the 2nd Ypres. Most noteably at the Battle of Frezenberg Ridge when all three of the Monmouthshire regiments suffered very heavily. After a period of all 3 battalions being merged, the 3rd were eventually deployed with the 49th division as their Pioneer Battalion. On 29th Dec 1915 whilst parading at Elverdinghe Chateau a shell landed in the middle of the assembled ranks causing numerous casualties. Due to the difficulties getting replacements for the 3 battalions it was decided to disband the 1st and 3rd battalions. Some 200+ men went to the 9th Welsh and 200+ to the 2nd Monmouths. I hope this of some help to you. As I said I will send you a more detailed account of the 3rd Mons privately. Any further info you have on your grandfather I would be very interested in as I didn't know what had happened to him after the 3rd Mons. Thanks for this. No obvious connection jumps out at me but I will check when I get home tomorrow. 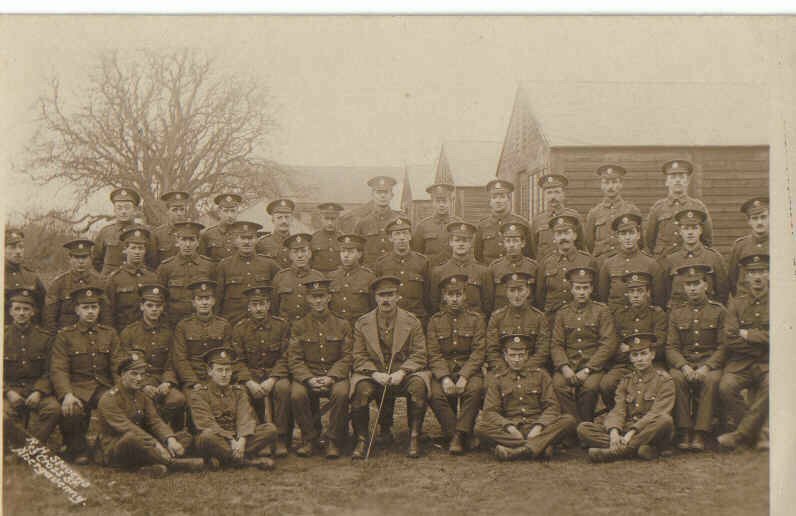 Having done some more research I have discovered that 40 men who were attached to the 171st Tunnelling Company Royal Engineers from the 3rd Monmouthshire's were actually themselves transferred to the Royal Engineers at the the end of May 1915. So it would appear that your grandfather's service with the 3rd Battalion Monmouthshires ended then upon his transfer to the R.E. where his new service number would have been issued to him. I have PM'd you what I know about the tunnelling exploits of the 3rd Batt at Hill 60 during March and April 1915. Hi I have my grandfathers medals and know he was in the 3rd mons 1914, but dont know where he finished up after they disbanded. In 1914 he was Pte W. J. Hemms (William James) no 1291. His brother Alfred no 1293 also 3rd mons. Can you direct me anywhere on-line or does it have to be a visit to Kew? I do have your grandfather and uncle listed on my database. Both it would appear were transferred to the 2nd Mons after the 3rd were disbanded in 1916. I will PM you with some info on what the 3rd Mons did during the war and also with the address of another forum member who will be able to provide further details of the 2nd Mons. Any info on this Battalion I am happy to do any look ups. Forgive me but I'm a bit ignorant about military things, and would appreciate any help. My Grandfather Percy Vescount served in WW1, I have a copy of his MIC which states he was a Pte in the Monmouth Regiment, no idea what battalion. He had 3 regiment numbers, 2904,15821 and 267708. At the timeof WW1 he was living in Blaina, South Wales. He died over 25 years ago and I remember he would never discuss his time in the army. Your grandfather seems to have moved between the three Monmouthshire Battalions. The 267708 number is a 2nd Monmouthshire number but he also served with the 3rd and 1st Mons. He was also attached to the 174 Tunn Coy at some point. In the absent voters list he is listed as 1st Mons. Second lieutenant Charles Constantin Lionel Straker. Any mention? DOW 07/07/16 with the 3rd Monmouths. I've ordered a copy of the history on inter-library loan, so I don't need a great deal of detail, but like a kid waiting for Christmas I'm dying to know if he's in there! I have a photo of him as a schoolboy and I know he was from the Straker family of auctioneers in Abergavenny. Many thanks for your reply, it's really kind of you to take time to find out for me. I hope you won't mind if I ask a couple of other things. Why would somebody move between the three battalions? Forgive my ignorance who were the 174 Tunn Coy? A friend of mine has asked me to find out anything about a distant soldier relative of his, & has lent me some documents regarding his service with the 3rd Mons. I have looked through your excellent website and I have downloaded a copy of his MIC. If I list the information we already have on him could you look him up for us to see if there is anything else to add? Pte. Daniel Skinner, 3rd Monmouthshire Regt., born Bedwellty nr. Ebbw Vale, enlisted 23rd of February 1909 & was employed by the Ebbw Vale Company as a labourer prior to embodiment. He had two service nos., 714 & 290059. A small piece of paper with his certificates mention that he was aged 55 in 1940 so he must have been born 1885. His total service in the Territorial Force was 8 years 131 days including 2 years 332 days embodied service. Service abroad, viz., in France - years 211 days. MIC shows entitlement to 1914-15 Star, B.W.M. & V.M. Discharge certificate stamped OFFICER I/C RECORDS WELSH DIVISION SHREWSBURY 2 - JUL. 1917 states "is discharged in consequence of Termination of Engagement AL Is 316 and 787 of 1917 para 392 xxi Kings Regulations". The attention of soldiers who have taken their discharge on termination of engagement, but who are physically fit for service, is drawn to the great need for trained men with the largely expanded Armies which have been called into being since the outbreak of War. It is hoped that such men will decide to return to the Colours with as little delay as possible, and so add to the services they have already rendered to their King and country. No pressure then! We do not know what he did after July 1917, would he have been liable to conscription? He was definately a 3rd Mons man who was transferred over to the 2nd Battalion Monmouthshire Regiment in 1916 when the 3rd was disbanded. Unfortunately I don't have any specific info on him but if you like I can send you a precis of what the 3rd Monmouths did during the war. I do have a photo of Lt Straker. Please send me your email and I will forward it on to you. Thank you for the very kind comments about the website I'm glad you liked it. "We have just come out of the trenches. We went in last Friday so we have had a fair share of it...I am pleased to tell you I have just been congratulated for bringing a wounded man out of the trenches and taking him back to the dressing station - a mile back - in broad daylight and above all who do you think it was - Youn Pocock....He was with another sergeant in a support trench behind my fire trench and he got shot right through - the bullet passing through his lung. This was in the morning 9 am....He would have died if he had been left until night, so I crawled out under fire to where he was, dressed his wound and crawled to let my captain (Capt RO Gardner) know... a chap belonging to the King's Own volunteered to come back to the support trenches with me. We had no stretchers, so took a brushwood fascine from a trench with us, - the task was to get him out. So two more of the boys - Dan Skinner and Sullivan volunteered to come back to our headquarters with us, so we started out. We had not gone far when the Germans opened a heavy fire on us, so we dropped down in a ditch, and, the fascine being so heavy, we made a stretcher of two branches and our putties and managed to get him away all right"
Pte Pocock unfortunately died of his wounds. He was just 16 years old. Arabis does your friend have a photo of Pte Skinner?? martyn is this the lad dow home buried in ebbw vale ? I have been trawling through some copied paperwork and I discovered that the letter I quoted to you last night was also published in the Abergavenny Chronicle dated Fri 30th April 1915. If your friend so desires I will have it copied and sent on.